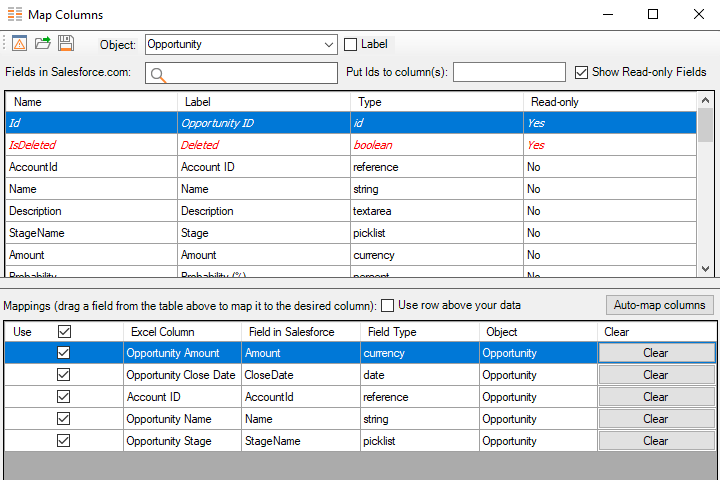 Starting with XL-Connector version 3.0, you can chain-load multiple related records in one shot and make all the Master-detail or Lookup relationships work. 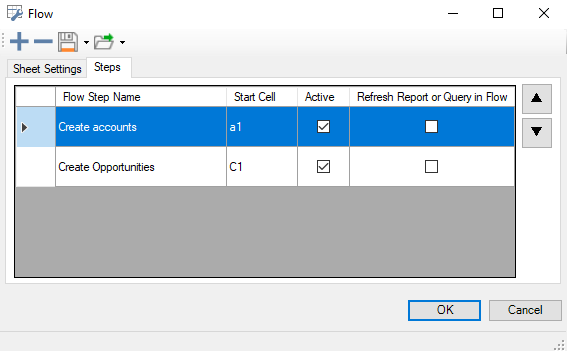 In this article we’ll show you a simple scenario of creating two Accounts with five Opportunities under each of them. You can download the template file we’ll create in this post from here. To make this operation possible, we’ll use the new ability of XL-Connector to have multiple flow steps in the same worksheet, which allows to perform multiple DML operations on different SFDC objects sequentially. To be able to create this template, you must be running XL-Connector Enterprise Admin. Once created, the template can also be used in XL-Connector Team Player. 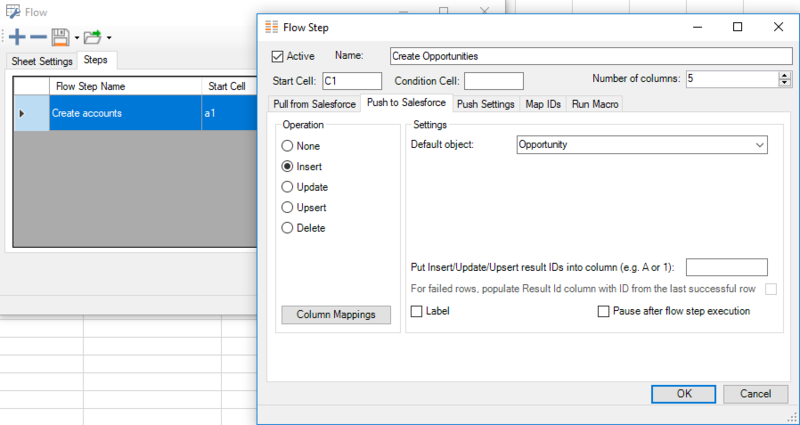 Click OK to close the Column Mappings dialog box, then make sure All Rows is specified under the Push Settings tab. Click OK to save the Create Account mapping. At this point the part of the template responsible for the creation of Accounts is completed. 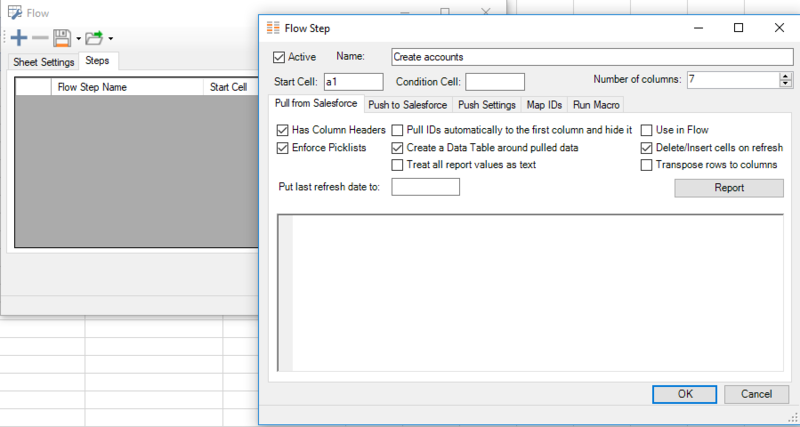 Click on the ‘Plus’ button in the Edit Flow dialog box again to create another flow step, this time indicate that the data will start at C1. 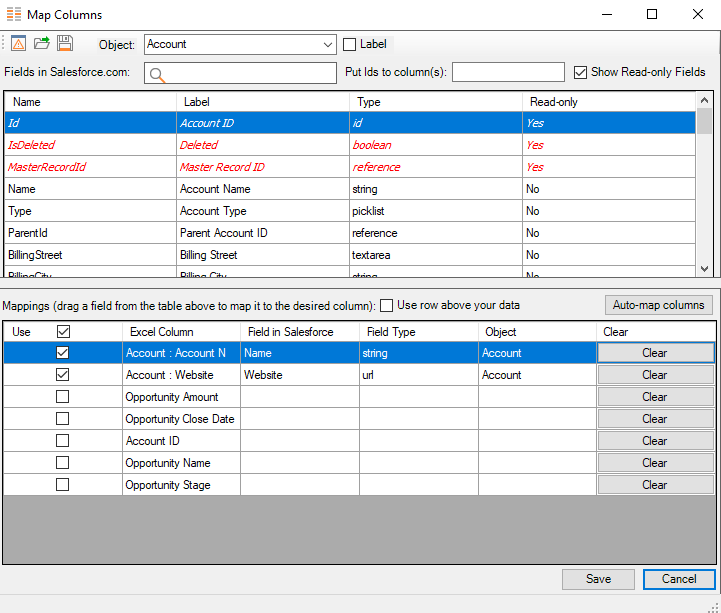 This flow step will be used to load Opportunities under the Account created in the first step. You can rearrange the mappings and thus their order of execution by clicking the Up and Down arrows on the right. As a result of this operation, there will be 1 new Account in your sandbox, and 5 related Opportunities. You can quickly verify it by selecting one of the Account Id and clicking Open in Salesforce button up in the ribbon. As you’ve probably already realized, we used a trick where Accounts in rows 3-6 were not loaded due to an error (we didn’t specify the Account name on purpose) and setting in the Create Accounts mapping allowed us to put the Created Id to the C column not only for successfully created accounts, but also for the failed ones, thus allowing us to create multiple Opportunities under the same Account. The order of execution is defined by the order of appearance of mappings in the Flow Steps dialog box. Purposefully make parent records fail by not providing a mandatory column to have only child records load for that row. 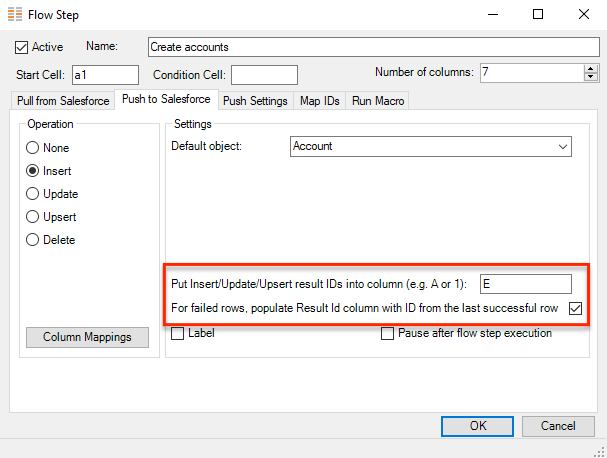 Make sure that For failed rows, populate Id column with with result Id from the last successful row box is checked.